What Does CRI University Do? CRI University provides informative and dynamic one-hour webinars and recorded educational sessions on important HR topics that impact every employer who employs fifteen or more people. CRI University topics are offered both live and as recorded sessions for registrants who choose to view the materials and listen to the recording at their leisure. These webinars and educational sessions are as important to CEOs, COOs, and CFOs as they are for HR personnel due to the myriad of changes in employment laws, regulations, discrimination findings and court case findings in 2009 and thus far in 2010. CRI University topics cover which employers must be compliant with each act and/or agency requirement, how to best attain compliance and how to eliminate potential liability for not being in compliance. In addition to topics focusing on employer compliance with employment acts, regulations, etc., CRI University also provides webinars and educational sessions that inform employers on how to attract, screen, hire and retain a more effective and productive workforce. Each live webinar qualifies for one hour of HRCI credit. Individual webinars and educational sessions are $ 65.00 each. Select any 3 and get the 4th free. You may also purchase all 14 recorded educational sessions as a package for $ 495.00. The products and services provided by Candidate Resources, Inc. (CRI) have their roots in a localized personnel testing practice formed by a group of industrial psychologists in Dallas, Texas in 1957. Dr. John L. Shirley and other psychologists used the prominently recognized psychological tests of the day to test people for potential leadership roles in organizations. Early on, start up customers were Morris Zale and Ben Lipshy, his father-in-law, who built the Zales Corporation, Mary Kay Ash, who originated Mary Kay Cosmetics, Ebby Halliday, who originated Ebby Halliday Real Estate, Mary Crowley, who originated Home Interior Decorating and Gifts, John and Jerry Thompson, who started 7-Eleven, which later became Southland Corporation, and Charles Tandy who acquired Radio Shack when it was in bankruptcy. Dr. Shirley and other staff psychologists tested and interviewed each of these individuals, their children and people hired, to determine if they were the right individuals to build these companies. Forty-seven years ago, the testing fee was $250.00 per person which included compilation of the resulting report and its presentation. As the years passed, these clients pressed for a more economical way of testing applicants since, at that time, they were required to bring job applicants to Dallas, then those applicants spent one to two days in the psychologists' offices undergoing a battery of tests and interviews resulting in a report which reflected the test and interview results. As a result of this request for a simpler, more economical testing solution, Dr. Shirley contacted Dr. Raymond Cattell, who developed the Sixteen Personality Factor (16PF) - a leading psychological assessment. Dr. Cattell participated in the building of a new test, along with Dr. James L. Moore from Purdue, Dr. Shirley and two other noted psychologists. Together, they built the first test to debut in America that measures mental aptitudes critical to any job, behavioral traits that were purely job-related, and validity scales all in one instrument. Prior to the instrument's creation, there were no purely job-related tests that contained a measurement of aptitudes, behaviors and validity scales in the same instrument. Today the test they developed is known as the Achiever. All other similar tests are derivatives of the Achiever and various other organizations today pay royalties to Candidate Resources for use of CRI's technology and copyrights. Milton S. Cotter, who began working for Dr. John L. Shirley in the early 1970's, began a process of transitioning The Achiever instrument into one that could be used by employers across America. Mr. Cotter worked with Dr. Max L. Fogel, a leading neuropsychologist, and Dr. C. Alan Siebenthall, to document the Achiever interpretive reporting process and the appropriate materials enabling trained laymen to administer and score the tests in a more effective and economical manner. Mr. Cotter began emphasizing the use of benchmarks in conjunction with The Achiever assessment. Benchmarking is conducted by assessing people who are successful in their jobs by job category as identified by their employers, followed by the determination of the aptitudes and behaviors they had in common and their levels. These common traits, as determined by the Achiever, become the benchmarks against which applicants are then compared. By the late 70's, Cotter began experimenting with computers as a way to deliver testing and the resulting reports more efficiently. In the 80's, he worked with computer programmers to program The Achiever scoring system and reports into Basic and began delivering test results from specially-built Intertech "superbrain" PC's. This era gave way to creation of MS DOS software to score and deliver test results. This model and client service system was used across America in the late 80's and the 90's, until the internet became more prominently used by individuals and employers. For the last ten years, CRI has built and delivered Applicant Management Systems for employers across America. The CRI Applicant Management System directly addresses the employment guidelines that require differentiation between job seekers and qualified applicants and the data collection and processing required by the EEOC and OFCCP. It also provides employers a means to increase applicant flow while providing an economical, effective and objective way of choosing the best candidates for job openings. 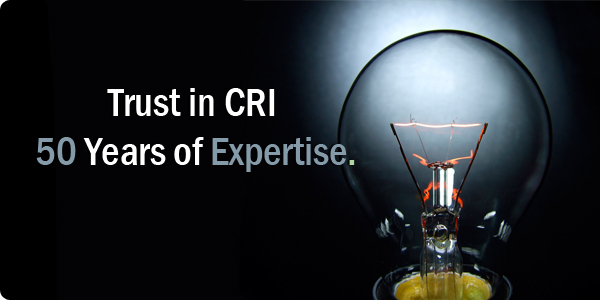 In January 2009, CRI launched CRI University to provide Professional Development Webinars on timely topics that impact every employer. These webinars provide educational and practical information on employment law and related issues beneficial not only to human resource personnel, but also to executives who need to be aware of the requirements that can impact the operation they manage. Any leading company cannot overemphasize the need, the requirement and the primary importance of the organization's human asset base. The organization's human capital is worth much or more than the capital base. Recognizing the need and acting on the need to pick the best people for a job is critical today and will be in the future, thus the need for CRI's products and services.